Not content with the current tilted planning system the Mobile Operators are hoping to slew the planning regulations in their favour still further. "I’m Kevin Kunze the director of Reconnect, a documentary on the potential negative health effects from cell phone radiation, the proposed policies regarding safer use, and the mainstream media’s portrayal of the issue. I’ve been working on this film for nearly two years interviewing doctors, politicians, cancer patients, and representatives from the cell phone industry. Although we’re nearly finished with the film there is still a lot that needs to be done, including: filming additional b-roll, motion graphics, composing an original score, color correction, sound mixing, licensing footage, submitting to film festivals, and creating an interactive website. Take a minute to watch our trailer and see how far we've come." The BMJ is set to publish an 'update' to a study that finished over 4 years ago  (and used data even older) and was widely criticised at the time for its design - that it appeared to be designed to come out negative for tumours in that they had excluded heavy mobile phone users from the study (the business users). More recent studies - including the Interphone Study (itself somewhat flawed) - have shown a significant increased incident of brain tumours and related cancers in long-term (10 years use for 1/2 hour per day) mobile phone users. Because of these other studies etc. the World Health Organisation (WHO) in conjunction with the International Agency for Research on Cancer (IARC) have this year declared microwave radiation - used by mobile phones and other wireless devices - to be a class 2b carcinogen "Possibly carcinogenic to humans"  . This means that microwave radiation is a possible cause of cancer. The re-release of the Danish study is part of an industry-orchestrated backlash to delay legislation to limit microwave exposure and place mandatory health warnings on mobile phones (in the style of cigarette packets) and other radiation emitting devices such as WiFi routers, smart meters and cordless landlines. The 4G spectrum sell-off would be adversely affected with such a move. and all its inhabitants against unnatural Electromagnetic Radiation (EMR). With this endeavour, people from around the planet join together to reduce harm from EMR and create a healthier life for all. harming people, animals, insects and plant life. While some man-made EMR sources are falsely marketed as ‘green’, they all independently produce adverse biological and health effects. The effects markedly worsen with prolonged exposure or when combined with additional EMR sources, chemical toxicants or metals. MW radiation intensities in urban areas can be over a trillion times higher than natural background levels. All life is electromagnetic in function. living systems depend on undisturbed electrical signaling processes. which have now been overwhelmed by man-made EMR. and call for minimised exposures. EMR Action Day provides support and information on sources, effects and solutions to communities and individuals in need. Harmful EMR also includes ionising radiation from nuclear power plants and nuclear weapons. We urge reduced exposures to all such sources including medical tests, treatments and wastes. shielding materials; and safe White Zones and other EMR-free solutions. We engage people in minimising EMR exposures and reconnecting with their own natural biorhythms. defend public safety and restore electromagnetic harmony to the Earth. Our focus is on solutions that benefit us all. 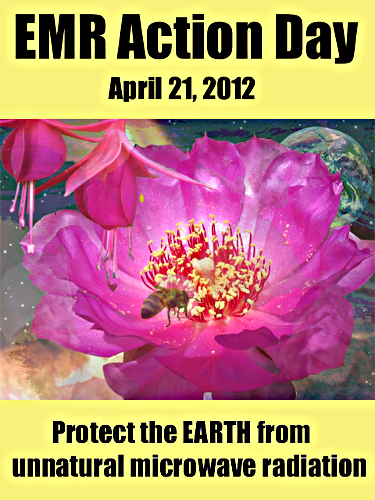 Worldwide EMR Action Day aligns with Earth Day 2012 to protect the biological integrity of the natural world and all its inhabitants against unnatural Electromagnetic Radiation (EMR). With this endeavour, people from around the planet join together to reduce harm from EMR and create a healthier life for all. so-called ‘smart’ utility grids, meters and applianceswireless internet (wi-fi), wi-max and their infrastructuresmobile phones and their antenna infrastructure on masts, rooftops and in disguised structurescordless phones and their basesmicrowave oven leakagebaby monitors and children’s RF-related toysRF medical devicesRFID-embedded chips in people, animals, consumer products, and identity and credit cardsdirect-energy and other EM weaponryTV, radio and satellite broadcastsradar and sonarthe electrical power grid, appliances and broadband over power lines (BPL)fluorescent lights, including compact fluorescent lightbulbs (CFLs). While some man-made EMR sources are falsely marketed as ‘green’, they all independently produce adverse biological and health effects. The effects markedly worsen with prolonged exposure or when combined with additional EMR sources, chemical toxicants or metals. MW radiation intensities in urban areas can be over a trillion times higher than natural background levels. All life is electromagnetic in function. From the symbiotic balance of wildlife ecosystems to the health of our internal cells and organs – especially the brain and heart – living systems depend on undisturbed electrical signaling processes. All creatures derive a sense of wellbeing from the Earth’s own Schumann Resonances and other natural fields, which have now been overwhelmed by man-made EMR. Scientists and experts in policy and law, examining thousands of research studies, warn of immediate and long-term hazards and call for minimised exposures. EMR Action Day provides support and information on sources, effects and solutions to communities and individuals in need. Harmful EMR also includes ionising radiation from nuclear power plants and nuclear weapons. We urge reduced exposures to all such sources including medical tests, treatments and wastes. EMR Action Day proposes new choices for safer and lower energy consumption: hard-wiring and fibre-optics in homes, schools and workplaces; shielding materials; and safe White Zones and other EMR-free solutions. We engage people in minimising EMR exposures and reconnecting with their own natural biorhythms. By our judicial, legislative, media, artistic and other creative endeavours, we act to free humankind, defend public safety and restore electromagnetic harmony to the Earth. "As the United Nations meets in London yesterday and today to assess the global impact of the five leading chronic diseases--cancer, diabetes, mental illness, heart disease, and respiratory disease-- there is a glaring omission in the environmental risks not being analyzed for impacts on health and economy. That omission is the massive explosion and intrusion of wireless technology into every facet of life. "Even without factoring in the proven biological effects of RF (microwave) radiation, the World Economic Forum (WEF) estimates the health costs for the above five diseases could reach $47 trillion over the next 20 years . . .
"Wireless technology is an identified risk causing ill health in all five areas addressed by the WEF-- cancer, diabetes, mental illness and respiratory disease-- carrying potential for huge economic and almost incalculable global impacts, growing in danger and in tandem with the wireless infrastructure rollout throughout the world. Until the World Economic Forum addresses this elephant in the room, any prediction for a troubling outlook will be a euphemism."